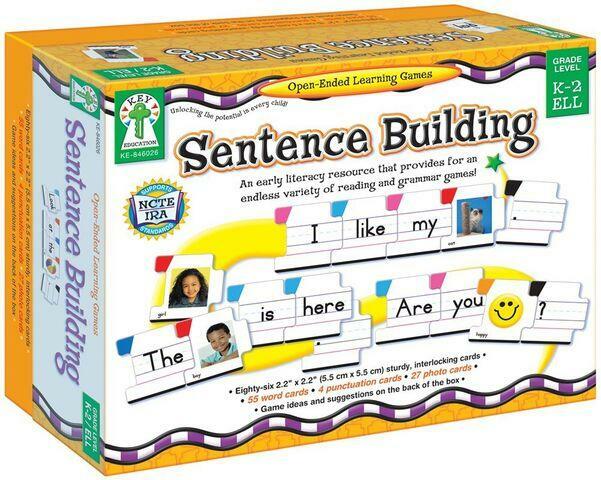 Enhance early grammar and reading skills with sturdy, interlocking cards that cover parts of speech, capital letters, punctuation, building sentences, and more! Tailor activities to different learning levels with this fun set, which includes grammatically color-coded cards (55 word, 4 punctuation, and 27 photo cards), game ideas, sample sentences, and teaching suggestions. It also supports NCTE and NAEYC standards. Dimensions: L: 8" x W: 6" x H: 2.6"